OVERALL TAKEAWAY: Don't expect any beach party from Alberta Ferretti next spring! 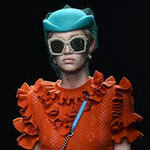 This season the designer went under the sea for her inspiration, pulling details like edgy barnacles, fluid seaweed, twisty coral, and all the colors of the ocean for her Spring 2013 collection. Silhouettes were sleek and figure-friendly, done up in fabrics of silk organza, chiffon, and an abundance of fringe, beadwork, and delicate appliques — all of which mirrored the underwater creatures from which she drew inspiration. A color palette of seafoam green, aqua blue, shimmery iridescent pearl, and deep sea blues decorated a line up of top tier models including Hanne Gaby Odiele, Caroline Brasch Nielsen, and Daria Strokous — each of whom echoed the fluidity of the collection as they made their way down the runway. This will no doubt be a hit among socialites and celebrities like Lauren Santo Domingo and Gwyneth Paltrow.